Why hike to Mono Meadow? The Mono Meadow trail, used primarily by backpackers on their way to Yosemite's spectacular backcountry, is the "The Empire Strikes Back" of hikes: it's enjoyable on its own, but everyone knows it's really just some essential ground that has to be covered on the way to something better. What will you see here? There's the meadow, of course, shaped like a ghost that's been garroted at the waist by the trail and is now, to its chagrin, watching its two halves drift apart (check out the satellite view if you harbor doubts). It's a pretty meadow, with all the usual grass and flowers and leprechauns and whatnot, but not an exceptional one. If you hike to the overlook, you'll get a wide view of the Sierras, including Mt. Starr King and the back of Half Dome, but it's intermittently occluded by trees, and you can arguably get a better view by just driving around the corner from the Mono Meadow trailhead. In between the meadow and the overlook, you'll cross a stream with lots of interesting pockmarks in the streambed and pass through the remnants of a forest fire. Mono Meadow is a hike more for the Yosemite completist than the first-time visitor. Difficulty: A 3 out of 10. The hardest part will be climbing the slope from Mono Meadow back up to the trailhead at the very end of the hike, so make sure you leave a little in the tank. Try packing some dark chocolate to gird you for the final ascent. 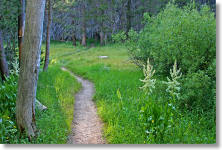 Best Time to Visit: The road to Mono Meadow is only open from June through October most years. The meadow will be greener earlier in the season, though the greenery & wildflowers should hold out well into July. Crowd Factor: Light. 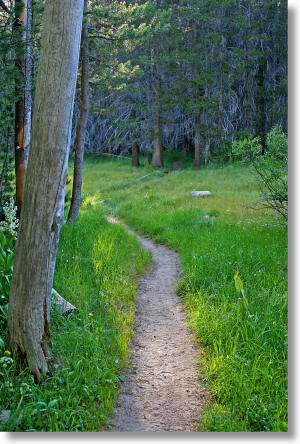 As mentioned above, the trail is primarily the domain of through hikers on their way deep into the Yosemite wilderness. Perhaps because of the light crowds, I've had good luck with wildlife spotting on this trail; bear, deer, and grouse have all crossed my path with varying degrees of indifference. Nearest Bathrooms: At the Ostrander Lake trailhead, 1.2 miles (2 km) west (no plumbing). The nearest bathrooms with plumbing are 10.5 miles (17 km) west, at the spot (formally known as "Chinquapin") where Glacier Point Road intersects highway 41. Nearest Snacks: 5.5 miles (9 km) east at Glacier Point. Getting There: The well-marked trailhead is along the south side of Glacier Point Road, 10.5 miles (17 km) east of the road's source at Chinquapin. From Yosemite Valley, take highway 41 south for 9 miles (14.5 km) to reach the Glacier Point Road; from Yosemite's south entrance, you'll find Glacier Point Road 17 miles (27 km) north along highway 41. Parking: There's a lot at the trailhead that rarely fills up. Here's a Google Street View panorama of the trailhead parking area. Hazards & Trail Notes: The trail begins with a rapid descent (300 feet/90 meters in half a mile) to Mono Meadow. You'll feel it on the way back up. If you continue past Mono Meadow, you'll climb gradually to reach an overlook of the high Sierras, just under two miles (3 km) from the trailhead. It's not marked, but should be easy to spot - it's a large granite shelf to the left of the trail. Shortly after this spot the trail begins switchbacking down towards the Illilouette Creek canyon, a good clue that you've overshot the overlook. There's a creek to ford en route to the overlook. There's no bridge, but there's usually a log crossing. Unprepared hikers lingering in Yosemite meadows have been known to offer passersby as much as a month's salary in exchange for a few squirts of mosquito repellent. Avoid this situation by bringing your own.